Except maybe that the amount is now nearly 16% higher than three months ago. And that the amount added last quarter is higher than the amount on hand 4.5 years ago. 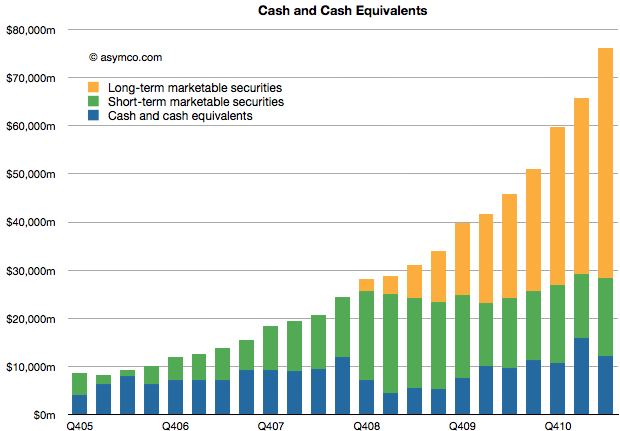 And that the cash added is higher than Google’s overall revenues in the quarter. In Q1 2009 the company’s share price briefly traded at $78. A buyer of shares at that price will have recovered their investment in retained earnings in nine quarters. How did I get the iPhone number so wrong? Here were my predictions for the third fiscal (second calendar) quarter from April 25th. Later in the quarter I updated them for submission to Philip Elmer-Dewitt’s blog at Fortune. The original and updated figures are shown in the following table (with actuals). As the Revenue and EPS figures are dependent on the other line items, the most significant error is clearly the iPhone where the error was over 30% (and hence deserves an F). The other figures were not very close either so the overall grade point average is a very mediocre C (2.3). So, as in previous quarters, nailing the iPhone number is everything. Having failed to guess correctly, the whole performance fell apart. So how did I manage to get the iPhone number so wrong? 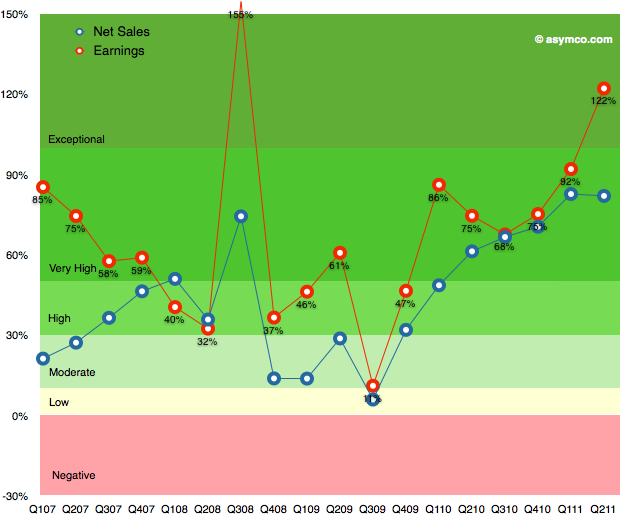 iOS products make up 71% of sales (and at least 78% of profits) which makes the following growth scorecard a bit moot. 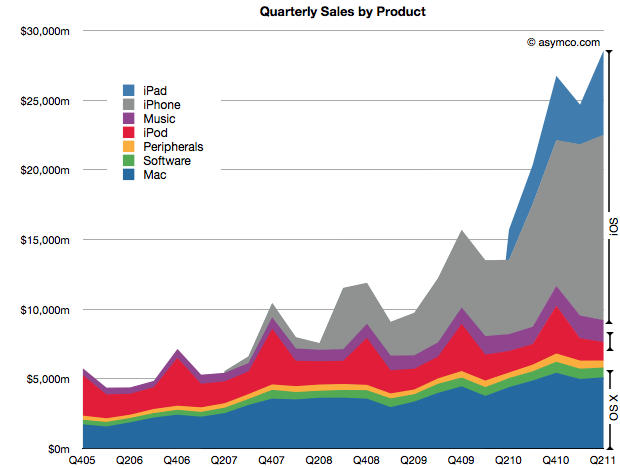 The growth in iPhone sales of 150% is hard to understand given the previous product cycle, but more about this later. The 122% growth in profits is (nearly) unprecedented. The growth in Q3 2008 was due to the launch of the iPhone 3GS and since there was no iPhone launch this quarter the growth shatters existing assumptions about the franchise. This performance needs to be digested and contemplated a bit longer but I will make one early conclusion: One of the most common themes during the last year was that Apple’s growth rate was unsustainable. 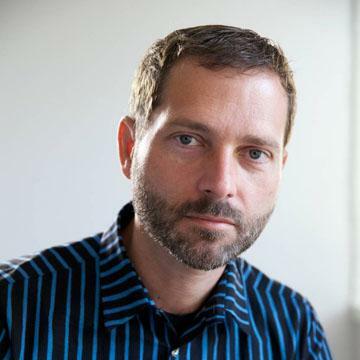 The theory cited was one of the “law of large numbers”. Apple’s performance shows it to be nonsense. Instead of decelerating, Apple’s growth is accelerating.